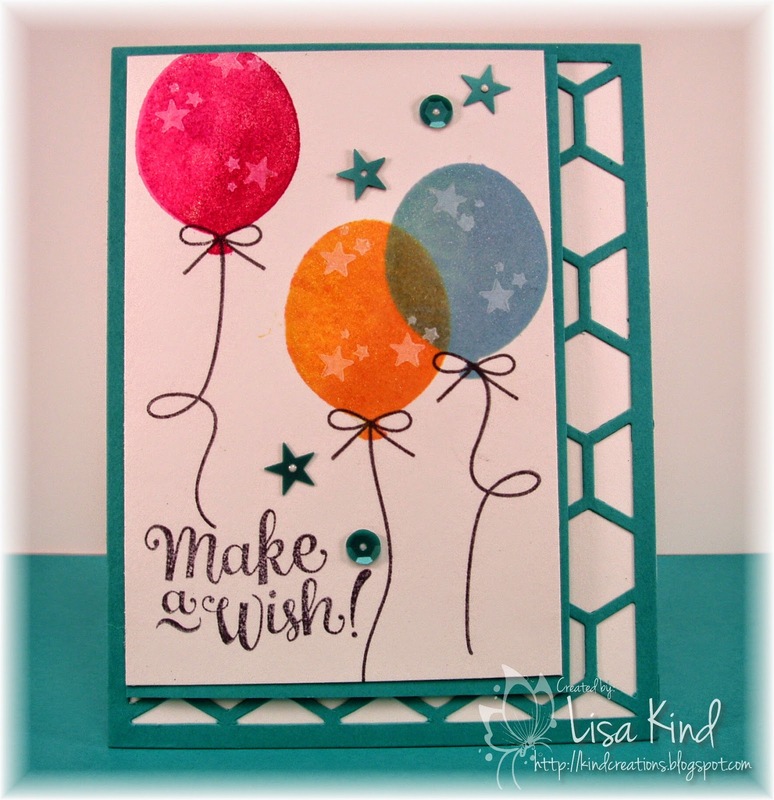 I was happy to see the balloons because I bought this set from MFT to try out a two-tone stamping technique I saw Jennifer McGuire do in this post. (I CASED her card as well!) Mine didn't turn out as good as hers (of course! ), but I do like the results. What you do is stamp the balloon in a lighter color then ink the stamp up in another darker color. Before stamping over the balloon again, you remove some of the ink so the balloon will be darker in one area giving it a shadow effect. 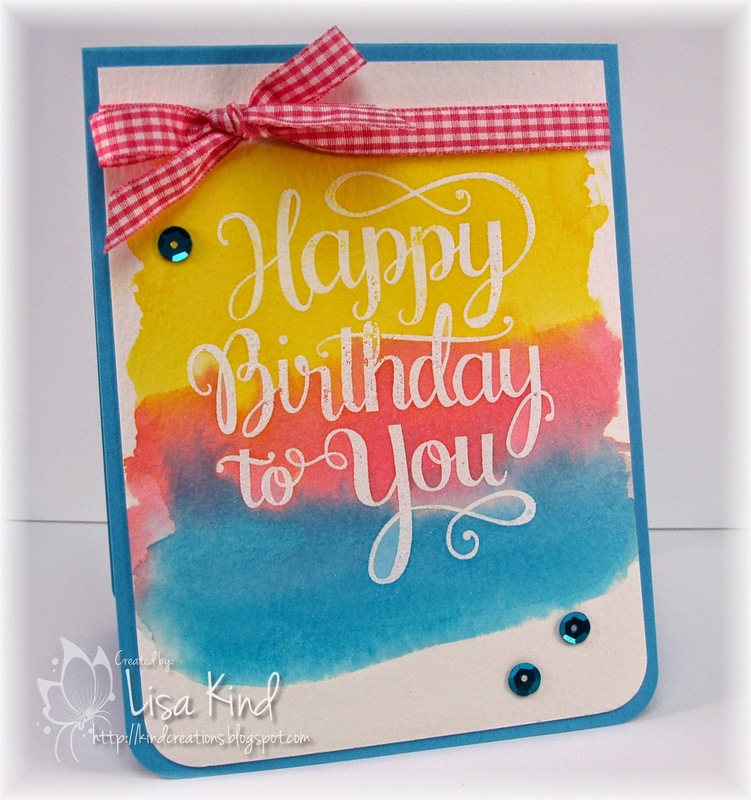 Once I stamped the balloons, I stamped the trio of stars in white pigment ink. I stamped off on a scrap piece of paper before stamping onto the balloon. The green and white fabric in the photo looked like hexagons, so I pulled out my hexagon cover plate and Bermuda Bay cardstock. I added the strings, bow, and sentiment in Basic Gray ink along with some sequins. You can see more inspiration on the DT blogs below. This is the last week our guest designer Lee-Anne Cross will be with us. She was a great guest and we loved her designs! Hi everyone! It's time for another Time Out challenge. This week we are CASEing a card by Virginia, which you can see below. You can see more from the design team at these blogs. Hi all! As I was scheduling this post last night, I realized today is my birthday! I knew it was today, but I was just kind of into making this card and getting this post done last night. So I guess I made this card for me! LOL! 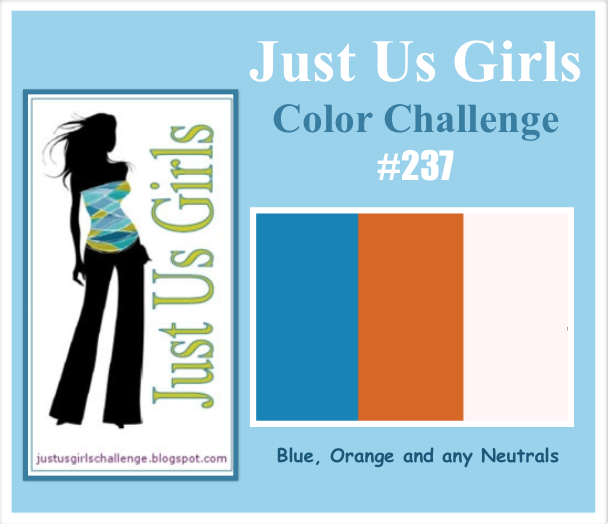 Anyway, the new challenge over at Just Us Girls is a color challenge and it's one of my favorite color combos! Sue V. chose these colors for us this week! I snuck in some green into my card...I couldn't NOT have green leaves! 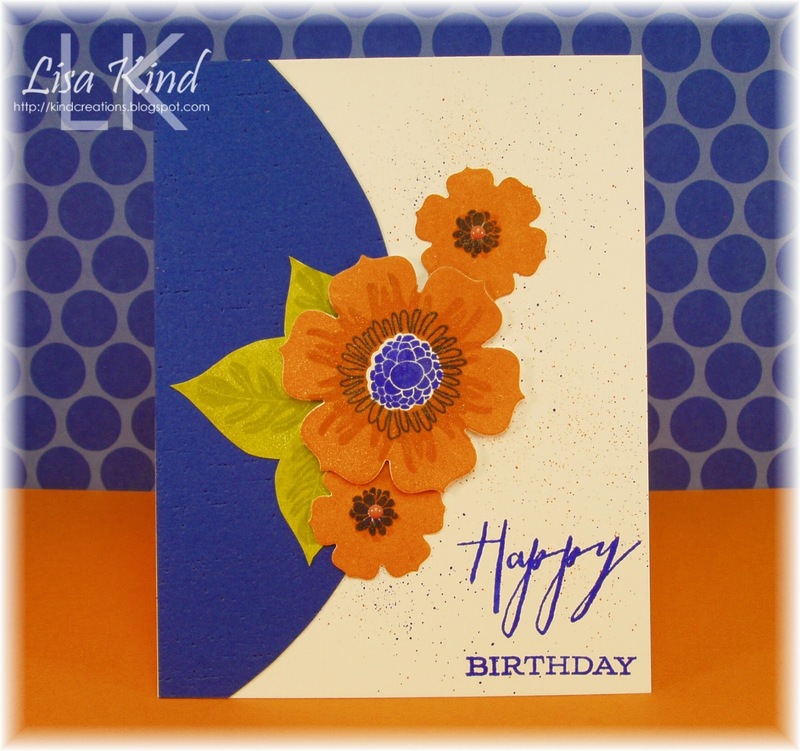 I chose to use the Happiness in Bloom set from PTI with pumpkin pie and brilliant blue inks to create the flowers. 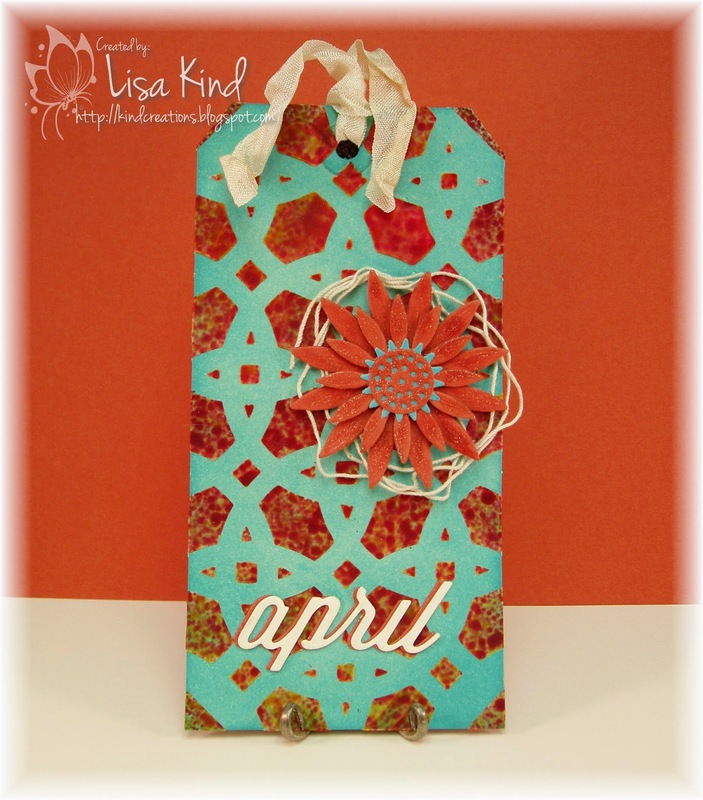 I also used these colors and Tim Holtz's spritzer tool on the background. First time using this tool and it's so cool! I also impressed the blue piece with the linen impression plate for some texture. There are enamel dots in the center of the smaller flowers and Wink of Stella shimmer in the flowers and leaves. 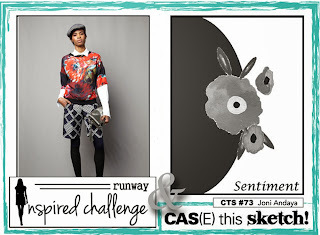 I used this week's CAS(E) this Sketch and it also fits the Runway Inspired challenge with the orange, blue, and white. 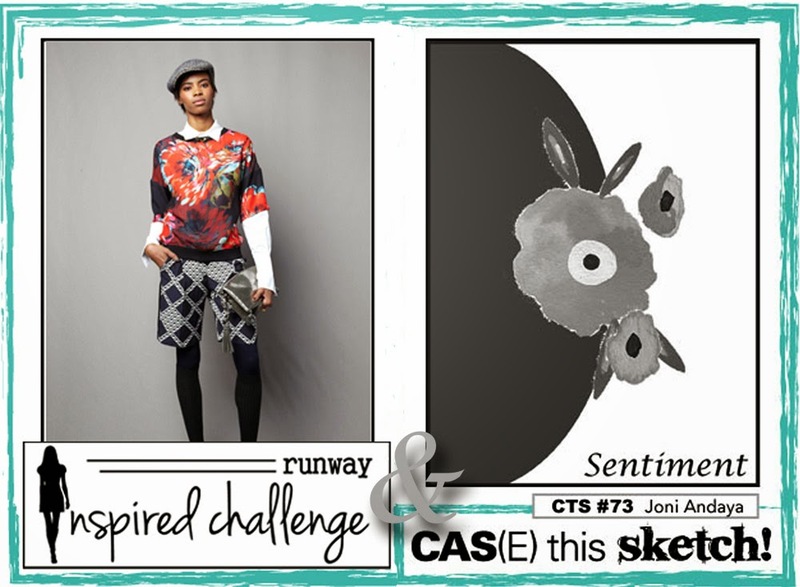 You can see more fabulous inspiration from the DT at these blogs. Hello friends! I'm hostess this week over at Just Us Girls and it's technique week. I chose this water colored background challenge weeks ago, and it seems that I chose a popular technique! It's all the rage in blogland recently! I chose to do something very simple with my card. I just took a piece of Tim Holtz water color paper and embossed the sentiment with Versamark ink and white powder. Then I wet the paper with a paint brush where I wanted the ink to be, and started coloring. I used reinkers here because they seemed to give me more vibrant colors. To finish it off I added a gingham ribbon and some sequins. 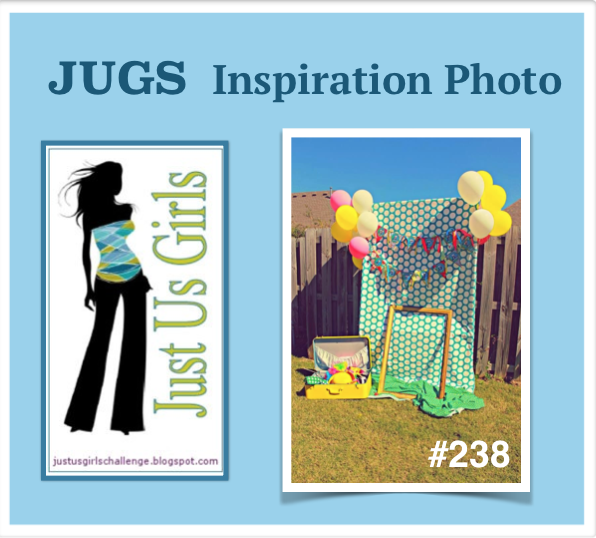 You can see more water colored inspiration from the JUGs DT and our guest at these blogs. Hi everyone! We have a new challenge over on the Time Out blog. This time around it's a theme challenge with an optional twist. The theme is Birthday and the optional twist is to make it a masculine birthday. And there are prizes too! More about that at the end of this post. I'm not good at masculine cards, so I chose not to use the twist. I was playing with some water coloring the other day and had this piece on my craft desk. I pulled out my Tipped Tops dies and went to work cutting it up. I die cut the shape and the word together. Then I die cut the word from the yellow cardstock and inlaid it into the water colored paper. Love that look. 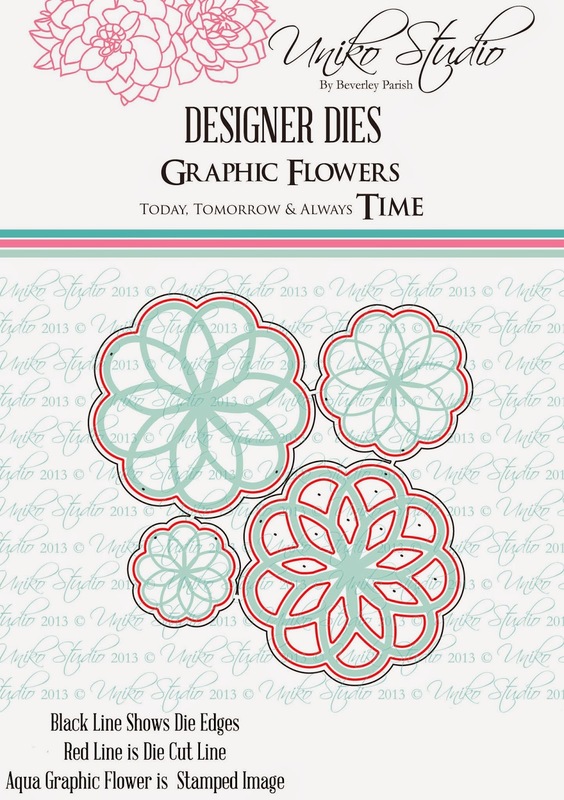 To finish it off, I created the flower added dimensionals in between each layer to bulk it up. I added some star dust stickles to the center for some sparkle. The sentiment was stamped in pigment ink and embossed in clear powder. Now for the prizes. We are giving away two prizes: one winner who uses the masculine twist and the other prize will be to an overall winner. The prizes are offered by Uniko Stamps. Prize 1 for those doing the twist will be chosen randomly and will be a £15 gift voucher. 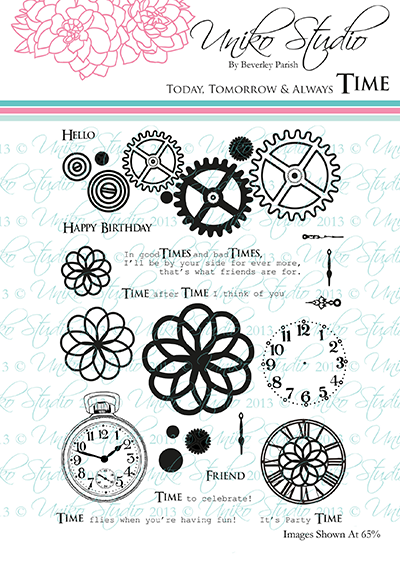 Prize 2 is the overall challenge and will receive these stamp and die sets. So we hope you play along. For more inspiration, stop by these blogs. Happy Saturday! How was your week? I hope it was better than mine! This was a big testing week in NY for our students in English Language Arts, and it was a difficult test for our kiddos to take. Three days of testing and 90 minutes per day! Yesterday I was at our training center for scorer training and it was a stressful, long day. Next week we correct them...fingers crossed they did ok! 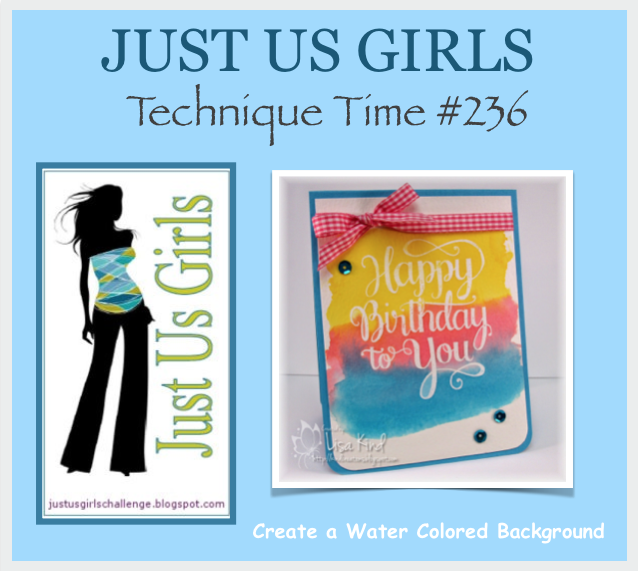 Anyway, crafting calms me and this week over at Just Us Girls we have a sketch challenge. Maria came up with this really fun sketch. I just bought this stamp set and matching dies from Paper Smooches Reverse Confetti called Carton Cuties. (I'm such a dork! 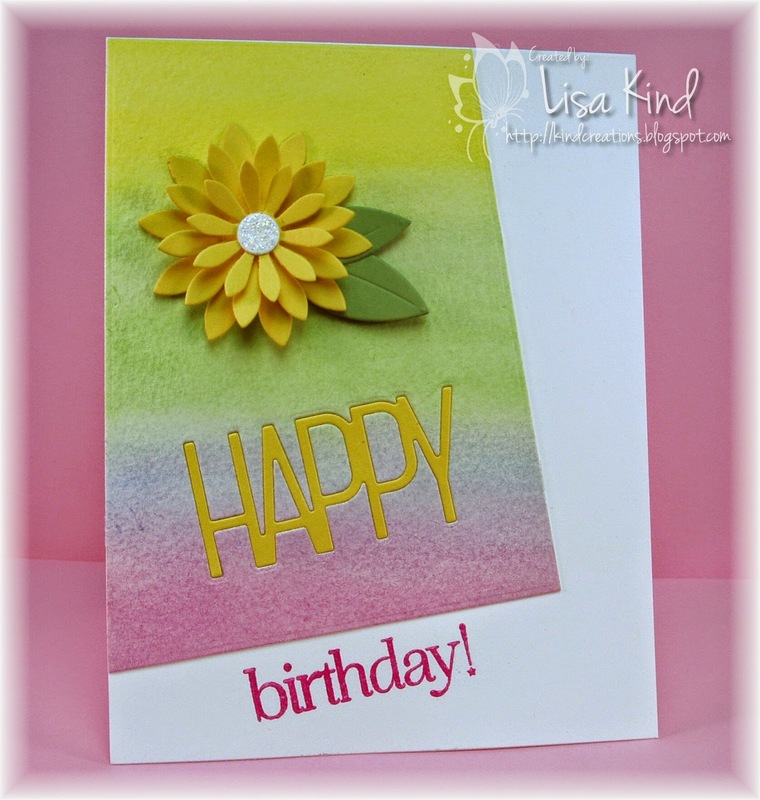 I entered this card in the Paper Smooches Sparks challenge and it's not a PS stamp set!) It is such a cute set! I die cut the little chickies, stamped the image, and then colored them with copic markers. I die cut the circles (I wish they were smaller) and added the chicks behind that panel. The green panel was run through a chicken wire embossing folder. I added some Wink of Stella shimmer on the chicks. Since this is the first challenge of the month, we have a new guest designer. We are welcoming Lee Anne Cross this month! Please stop by her blog and the DT blogs as well for more inspiration.